This book has it all - written by national and international experts and edited by world authorities, it is the first book on sport psychiatry in over a decade. Dealing with psychopathology, mental health problems and clinical management, it differs markedly from sports psychology books that focus on performance issues. Eating disorders, exercise addiction, drug abuse are all problems that are seen in 'everyday' athletes, not just elite performers. This book shows how to help. 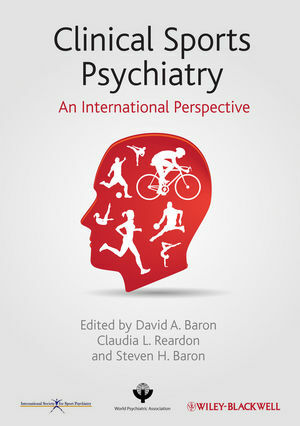 This text covers the most important topics in contemporary sports psychiatry/psychology from an international perspective. Chapter authors are experts in the field and global leaders in the related professional organizations, including current and past Presidents/Chairs of the International Society for Sports Psychiatry and of the World Psychiatric Association Section on Exercise and Sports Psychiatry. Authors are mainly psychiatrists: the rest are PhD sport psychologists. The book comprises representative chapter authors from around the world, to an extent unprecedented in this topic. The authors and editors are well-informed in global perspectives, e.g., having served as consultants to numerous Olympic teams, in addition to service on the International Society for Sports Psychiatry's Board of Directors. 4) the field of sports psychiatry (including work within one common sports psychiatry practice setting, and current status of and challenges in the field of sports psychiatry). There is a growing need for this book. Performance-enhancing drugs, use of psychotropics in impaired athletes, head trauma, sexual abuse, eating disorders, ethics, and depression and suicide in athletes, are just a few of the timely subjects addressed in this text. This is the only comprehensive reference available for those working in the field (or merely interested in it) to consult for current information on these topics. The existing sports psychology texts all focus on performance issues, with little, if any, attention paid to these areas of clinical significance. The book addresses the core differences between sports psychiatry and sports psychology, as well as the areas of overlap. Emphasis is placed on how the disciplines should work together in diagnosing and treating athletes dealing with emotional stress and psychopathology. Chapters include case examples and specific goals listed at the beginning, along with tables and graphs to highlight key concepts. David Baron, MSEd, DO, DFAPA, FACP, FACN is Professor and Vice Chair of the Dept. of Psychiatry at the Keck School of Medicine of the University of Southern California, and Psychiatrist-in-Chief of Keck University Hospitals of USC. He is the founder and Chair of the Section on Exercise, Psychiatry, and Sport of the World Psychiatric Association, Board member of the International Society of Sports Psychiatrists, and Director of the Center for Psychiatry and Sports at USC. Prof. Baron has published 5 books, over 20 chapters, over 85 papers, and is the executive producer on 2 films related to mental health in youth sports. He has won numerous national and international awards for his work in sports psychiatry over the past 3 decades. Claudia L. Reardon, MD is a Board-Certified psychiatrist and faculty member at the University of Wisconsin School of Medicine and Public Health. She completed her college, medical school, and residency training at the University of Wisconsin. She has special expertise in the diagnosis and treatment of psychiatric disorders in athletes, and in the use of exercise to prevent and treat mental illness. Dr. Reardon writes and speaks widely on these topics. She serves on the Board of Directors of the International Society for Sports Psychiatry and is the American Psychiatric Association Member Expert on sports psychiatry. She is an avid runner and comes from a family of accomplished athletes, including her Olympic gold medalist brother Andrew Rock.